Jeremy Corbyn Wins Labour Leadership Election 2015, Labour Out of Power for 15 Years! Voting for the the next Labour leader closed at 12pm today. The election followed the disastrous reign of Ed Milliband who not only failed to beat the Conservatives at the May general election but took Labour back towards the 1980's level of number of MP' after haemorrhaging virtually every Labour MP in Scotland to the Scottish Independence fanatics. 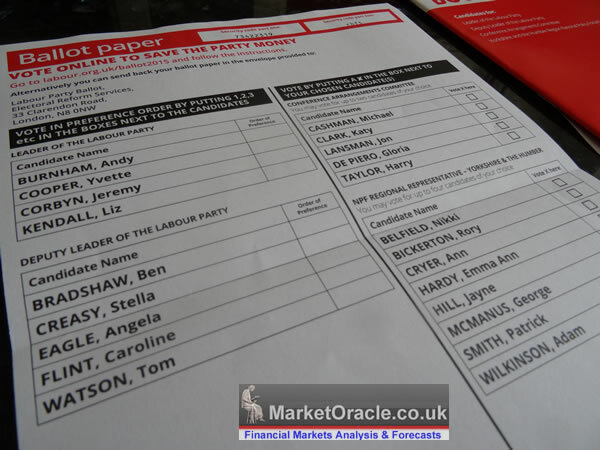 The Labour party script was for Andy Burnham to easily win, but to spice things up a little they threw in the left wing 200-1 outsider Jeremy Corbyn into the mix on 4th June. At the time no one, not even Jeremy Corbyn thought he had any chance of winning. However, the error in judgement that the Labour MP's have made is that they now had 3 New Labour 'Tony Blair' clones against someone completely different, who made statements the likes of which no major Labour politician has uttered in over 30 years. By the end of voting, Jeremy Corbyn looks by far as the most likely to win as a consequence of being 'different' to the other 3 candidates, a true left winger who arks back to the socialist fundamentalist policies of the 1970's and 1980's such as nationalisation of industries such as the railways and proposes the 'peoples QE', getting the Bank of England to PRINT about £120 billion a year for the government to spend on public services and benefits, the consequences of which would be accelerating inflation each year. The answer to why Corbyn will win lies in the disastrous changes that Ed Milliband made to Labour party leader election rules, the unforeseen consequences of which were that any member of the public could associate themselves to the Labour party and vote for just £3 and if enough do so then they would effect the outcome of a Labour Leadership election, and thus Jeremy Corbyn's campaign of promising everything under the sun paid for by printed money has galvanised mostly the young under 30's to join and vote for Corbyn. Of the 550k Labour membership voting pool approx 125k will be new £3 associate members, more then enough to effect the outcome. So why are the young so eager to vote for Corbyn' Socialism? The answer is simply that they AND their parents have probably only known Conservative and New Labour rule for the past 35 years! So that they have nothing to compare the Market Economy orientated economics of the Conservatives and New Labour and thus fail to realise just how disastrous Socialism will be for Britain in the future just as it has been in the past i.e. 1970's. Thus young voters are eager to rebel against 35 years of centre politics by electing to choose a Socialist Labour Leader with extinct 1970's policies and worse, outright money printing. Labour Cannot Win for 15 years ! My long standing view is that Labour had virtually no chance of winning the 2020 General Election, a Corbyn Leadership would ensure that Labour would also lose the subsequent 2025 General Election which means that the earliest the Labour party could even have a chance of winning would be at the 2030 General Election! That's another 15 years out of power!